The leading European pari mutuel/tote operators promote their business model, the pari mutuel system, which offers a vital support to the equine sector in Europe. 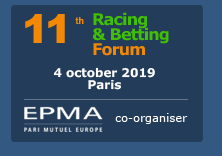 Members of EPMA are present in countries, traditionally active in developing the horse races and horse breeding (Austria, Belgium, Finland, France, Germany, Ireland, Italy, Norway, Netherlands, Sweden, Switzerland, Spain and United Kingdom). They wish to share their common concerns about developing efficient regulations taking into account the promotion of the equine sector and consumer’s fairness and protection. Pari Mutuel is a form of betting with internal values which guarantees the integrity of the sport. Indeed, with Pari Mutuel betting, the amounts bet are added together and shared among the winners, after the take-out of the operator which is completely independent of the result of the race. The Pari Mutuel operator has therefore absolutely no interest in the outcome of the race. In countries with the Tote model for betting, there has been no case of fixed races for years. Mutual betting is a way to prevent problem. Moreover, bets on ‘losers’ are not allowed, “In running” bets are not allowed. Bets are monitored in real time. Large amounts bets are detected (beyond a threshold). Pari Mutuel operators also detect certain combinations where there are a lot of big amounts bets. These combinations are compared with those expected (specialised press, for example) to determine if they are atypical or not. The model also detects easily after the race has been paid if there has been concentrations in winnings. Pari Mutuel model has the ability to finance horseracing in a maximised and predictable way: Large pools and no risk taken. - the operator’s ability to put all the information available at the disposal of punters without weakening his position. - Significant Pari Mutuel operators worldwide: Japan Racing Association, Tabcorp in Australia, Hong Kong Jockey Club, Singapore Turf Club, Korean Racing Authority, Phumelela in South Africa, Jockey Club of Turkey, Woodbine in Canada as well as Amtote and United Tote in United States. - Many of these organizations work in partnership with EPMA as Associated members. - Pari Mutuel operators are active in 15 countries in Europe – French and Swedish structures are the main operators. - Each structure supports the horseracing and equine sector with a strong % of the total betting turnover (more than 8% in certain countries).